ShareMyToolbox partnered with the Construction Financial Manager’s Association (CFMA) and the Institute of Certified Construction Industry Financial Professionals (ICCIFP) to compile a survey on tool tracking processes. The survey documented tool accounting practices & tracking methods of the respondents from 7000 organization members. 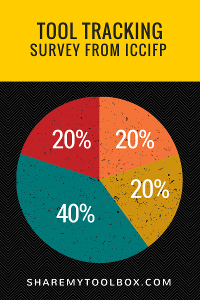 Tool tracking articles related to this survey on industry best practices are provided complementary by Viewpoint Construction Software in conjunction with the ICCIFP and ShareMyToolbox, LLC.